Mahira Khan is making headlines for all the right reasons these days. The superstar is currently in France, attending the 71st Cannes Film Festival as the first L’Oreal Hair Care spokesperson from Pakistan. The starlet channeled old-school Hollywood glam on the red carpet on Monday, wearing a black Alberta Ferretti gown with Chopard jewels. She shared the platform with her international stars such as Bollywood diva Sonam Kapoor and Hollywood’s Jane Fonda. However, the journey hasn’t concluded for the Pakistani starlet just yet. 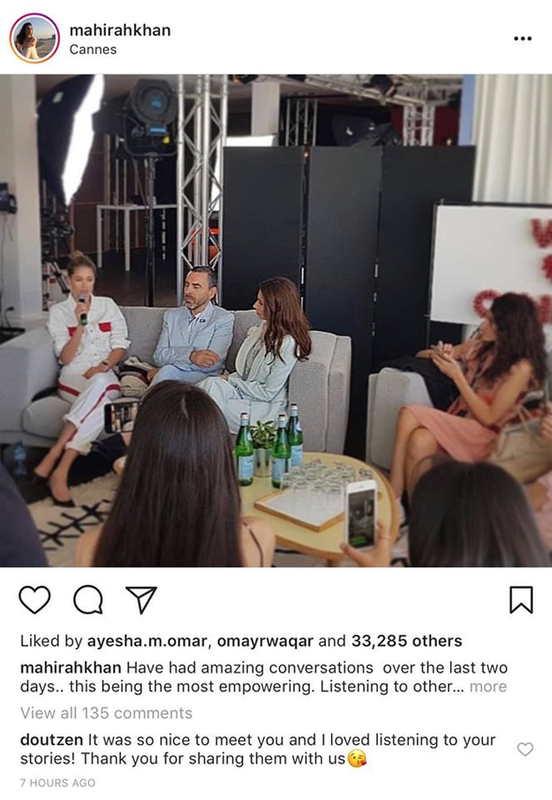 Mahira is still in Cannes and recently accompanied the Victoria’s Secret supermodel Doutzen Kroes to one of her interviews. We love how the Raees star has managed to inspire not just us, but many others on her debut visit to Cannes. Needless to say,Mahira is winning in life!